By Allen Fox: Amir Khan (26-2, 18 KO’s) will reportedly be abandoning the light welterweight division and moving up in weight to welterweight if he isn’t given an immediate rematch when the IBF and WBA meet to decide Khan’s fate based on his appeal of his 12 round split decision loss to Lamont Peterson last month. 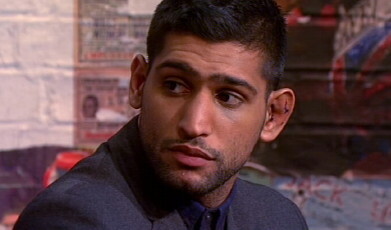 Khan is trying to get the loss overturned to a no contest as well as an immediate rematch ordered. It’s doubtful he’ll get both, but more likely than not Khan will get an immediate rematch ordered. Whether Peterson chooses to fight that rematch is open to question. He could be selected by Manny Pacquiao for his next fight in June, and Khan will obviously be forgotten as Peterson moves on to get a bigger payday. If that happens, Khan will move up to the welterweight division and try and track WBC welterweight champion Floyd Mayweather Jr. for a fight. Khan wants the Peterson rematch to take place in May in either Los Angeles or Las Vegas. He doesn’t want to ever fight in Washington, DC again, because he felt he was robbed in there. However, unless Peterson is stripped of the title, Khan may have problems with dictating the venue for the fight. He’ll likely get his way but Peterson’s trainer Barry Hunter could reject some of the places Khan and Golden Boy pick out. Also there is the question about who would be the referee. Khan had good luck when he used Joe Cortez in the past, as he kept Khan’s opponent Marcos Maidana from working on the inside at times. Peterson might feel more comfortable with having a referee work the fight that is strict about the rules so that Khan can’t push off and grab his head all night long like he did last time they fought. « Paul McCloskey not fighting: Does he need a new promoter?